Todays guest post comes from Ross G. Kreamer, the Assistant Deputy Administrator at the Office of Foreign Service Operation, who shares his experience of the exhibition Earth Matters with us. I very much enjoyed the thought-provoking exhibition Earth Matters at the Smithsonian’s National Museum of African Art. My observations are perhaps narrowly defined by my overseas career in agriculture. Having recently returned from a tour at U.S. Embassy/Pretoria as head of the Office of Agricultural Affairs, my thoughts on southern Africa and regional agricultural issues, e.g., food security, employment, trade & investment, the environment and sustainability, informed how I viewed the installation of the show. 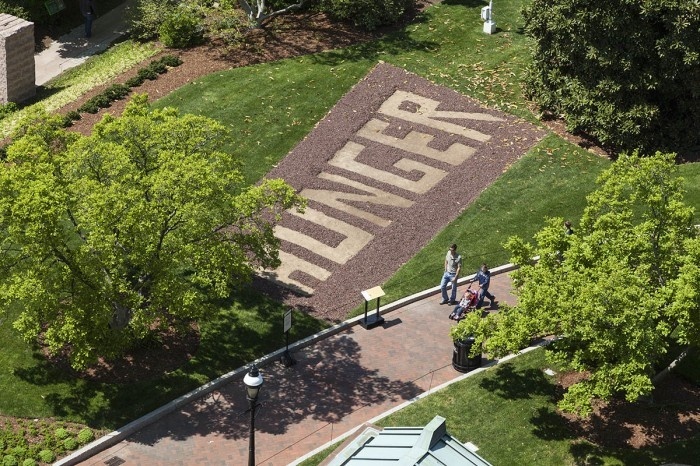 I saw, for example, the rice plot (spelling out ‘hunger’) in the garden only after it had been attacked by birds. The pest-damaged rice looked out of place in such a manicured setting, but crop loss is all too often what happens to rice farmers in Africa. Certainly the artist, Ghada Amer, addresses the very real issues of hunger that afflict many communities around the world, often the result of population growth, natural disasters, and failed policies. Hopes of a good harvest can be greatly reduced, and with it the specter of food insecurity. Having done graduate research in Ghana on cassava processing (into gari), I greatly enjoyed artist El Anatsui’s creative use of cassava graters in fashioning a structure that seems to rise and disappear at the same time. Throughout my overseas postings in Ghana, Indonesia, Vietnam, China and South Africa, I have often remarked upon the centrality of agriculture to cultures and communities. No wonder so many beautiful utilitarian objects & rituals are inspired by the agricultural cycle, in Africa and around the globe. Balancing the use of the earth’s resources to meet the food needs of a growing population is indeed a very serious matter. Internationally acclaimed artist, Anawana Haloba was born in Zambia in 1978 and now lives in Oslo, Norway. Haloba has also been involved in a number of international exhibitions, including the Dakar Biennale of Contemporary African Art (Dakar, Senegal, 2006), the Sharjah Biennial (2007, 2013), Manifesta 7 (2008), the 16th Biennale of Sydney, Australia (2008), and the 53rd International Art Exhibition at the Venice Biennale, Italy, in 2009. Her work appears for the first time in the United States in the exhibition, “Earth Matters: Land as Material and Metaphor in the Arts of Africa,” currently on view at the National Museum of African Art. In her work, Haloba explores the relationship between various populations as they collaborate and negotiate within socio-political, economic, and cultural contexts. Using primarily performance and sound-oriented video installations, Haloba examines the interaction between the historical and current narratives of communities, with particular focus on the political, social, and cultural tenor of the voices responsible for crafting them. For this talk, she will explore the history of her use of salt as a medium and discuss her current research at the Smithsonian on the influence of Franz Fanon and the role of women on independence movements in Africa and the Caribbean. Zulu woman in Natal, South Africa. Photograph by Constance Stuart Larrabee, 1949. Phokompe illustrates vividly this notion in his two works included in Earth Matters: Untitled #13 (2001) and Bambezela (2012). The former, created while he lived near Johannesburg, South Africa, reflects organic forms and pigments, natural materials and the working of the artistʼs hand. The latter was created after Phokompe moved to Brooklyn. Its grid pattern and sand paper are reflective of the rhythms of city streets and new construction. Despite their visual differences, both pieces utilize found materials taken directly from a place that Phokompe called home and both illustrate his ongoing interest in re-using and reinvigorating discarded materials. Phokompe describes his mother, a Zulu sangoma (diviner), as an early influence. Her ability to create a sacred space with simple objects fuels his attraction to found objects and informs his fascination with muti, or medicine bundles activated by a sangoma to communicate with the ancestors, heal, and restore order. Earth is also a central ingredient of muti. 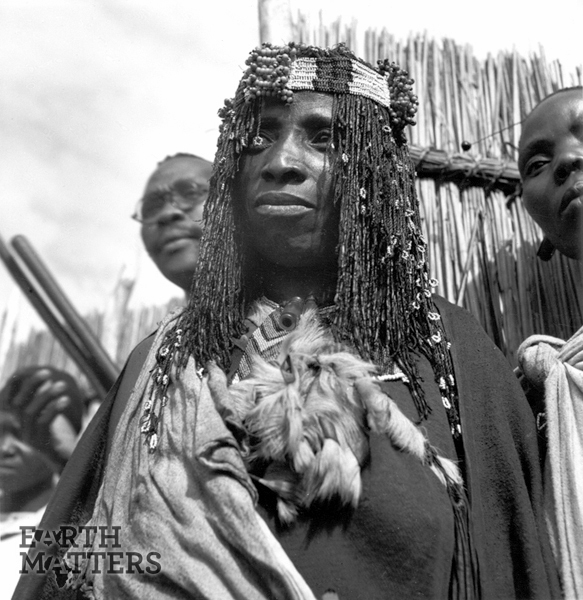 This photograph (1949) by Constance Stuart Larrabee of an unnamed Zulu sangoma presents the spiritual leader as strong and calm, a stoic force in the midst of the crowd that fills the background. The beaded headdress and fur near her neck marks this women as an important figure in the community, someone respected for her ability to commune with the ancestors. She bears the marks of someone empowered to locate the source of a problem or illness, and set muti into action. Today’s post will feature Nigerian born artist Charles Okereke, one of the artists featured on the Earth Matter’s exhibition. 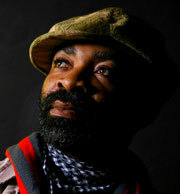 Okereke works with different media ranging from photography, video and sculpture. He also writes, acts and directs plays and drama pieces. 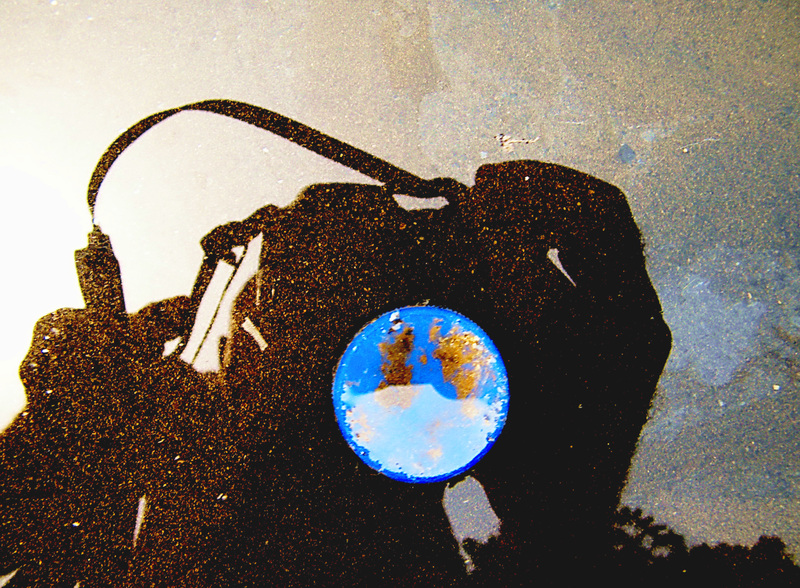 Once a Blue World, from the Canal People series below is currently showing in Earth Matters. In 2009 Okereke joined the Invisible Borders Trans-African Photographic Initiative, an artist -led project founded by Nigerian artists committed to affecting change in society. The video below traces the group of artists that participated in this project in 2011. Today’s guest post comes from Dr Mary Jo Arnoldi, who talks to us about the making of Mud Masons of Mali, an exhibition that opens next week on August 31 at the Smithsonian’s National Museum of Natural History. Be sure not to miss it! 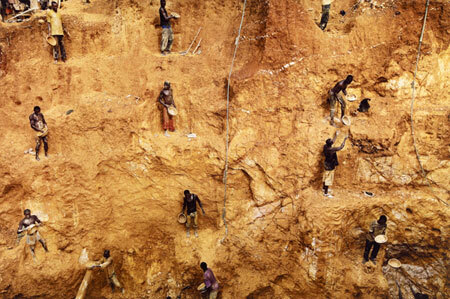 Mud Masons of Mali, part of the Grand Challenges Earth Matters initiative, opens on August 31, 2013 in the Focus Gallery of the African Voices exhibit at the Smithsonian’s National Museum of Natural History. It includes photographs, objects and 4 original films made in collaboration with masons from Djenné, Mali. In the exhibit the masons speak about the pride they take in their city, the skills they have acquired, and the different challenges they face in the 21st century. 1. The Grand Mosque in Djenné. 2009. Photograph by Barbara Frank. The original idea for Mud Masons grew out of a number of visits to the city of Djenné during the course of my research in Mali over three decades. Djenné, a World Heritage site since 1988, includes some of the most magnificent mud brick buildings in the world including the city’s Grand Mosque and over 200 historic houses (photo 1). My interest was certainly piqued by the architecture, but I also wanted to learn more about the men who build and maintain the city. 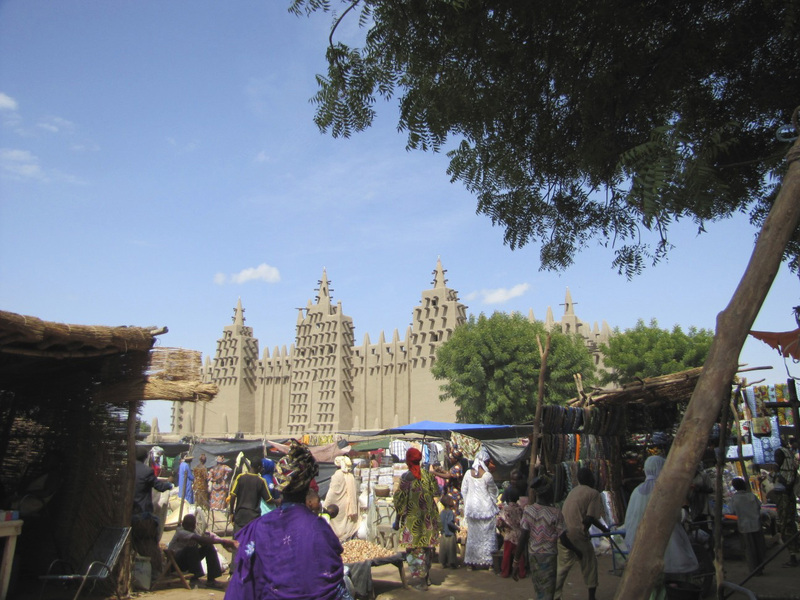 In 2003 I had the opportunity to work with a group of Malian masons who constructed a mud brick Djenné style city gate on the Washington Mall as part of the Smithsonian’s Folklife festival (photo 2). Later I was inspired by my colleague, Dr. Trevor Marchand’s collaborative research with Djenné’s masons (see his award winning book, The Masons of Djenné from Indiana University Press, 2009). 2. 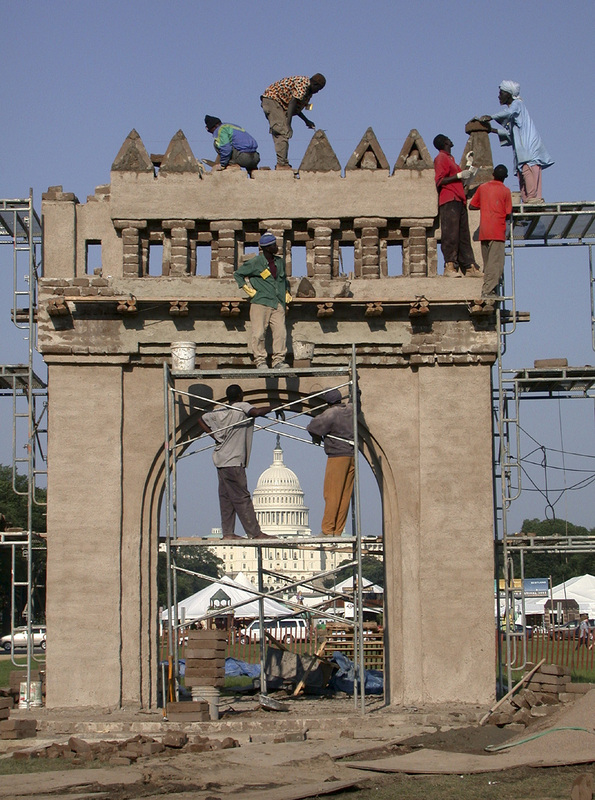 Malian Masons building a Djenné style city gate on the National Mall, Washington, D.C. 2003. Photograph by Hugh Talman. In 2010 Trevor and I began working together on this exhibit and the films. Many exhibitions and books have featured the architecture, but it was our intention to give a voice to the masons, themselves. Making the films has been a special delight involving working with five talented and generous Djenné masons: Konbaba Tennepo, Boubacar Kouroumansé, Lassina Kouroumansé, Salif Droufo, and Almamy Kouroumansé. Ranging in age from 77 to 21, each of them brings a different set of experiences to this story. Our project posed unique challenges. Midway into it we were blocked by the escalating war in northern Mali and by the political turmoil that followed the overthrow of the Malian government in March of 2012. Unable to film in Mali, we decided to bring the five masons to Leiden, the Netherlands along with Bilangalama (Bill) Sissoko, a colleague, now retired from the National Museum in Mali. 3. Malian Masons arriving in Amsterdam. 2012 Photograph by Trevor Marchand. Mody Sounfountera in Djenné handled the complicated logistics of getting passports and visas for the five masons and getting everyone to the airport and on the plane to Amsterdam (photo 3). Dr. Annette Schmidt, curator at the Museum für Volkenkunde in Leiden, worked with the Dutch embassy in Mali to secure the masons’ visas and hosted our film project at the museum. Pete Durgerian of Headfirst Productions from the UK shot the film in Leiden. He also sent a camera back with the masons to Djenné where Mody shot the masons’ working and other scenes in the city. He then uploaded the video over the internet to Pete, who incorporated segments into the films. We also commissioned an orginal film score from the Malian musicians, Lassana Diabaté (balafon) and Toumani Kouyaté (kora) which was recorded in Bamako. 4. Malian and Dutch masons at a building restoration site outside Leiden. 2012. Photograph by John Heywood. The change of venue led us to new topics and global exchanges that were incorporated into the films. The team visited a Dutch Victorian era restoration project and the Malian masons and the Dutch masons bonded easily over their mutual respect for the craft. Indeed, Malians and Dutch masons, alike, echoed the complaint that architects and engineers, who often direct restoration projects, have no real feeling or experience with how these buildings were constructed in the past (photo 4). We also spent a morning at a mosque with the imam, who had originally emigrated from Morocco. While the masons and the members of the Leiden congregation come from very different regions in the world, what united them all was Ummah, the community of Islam. The masons are now back in Djenné, the war in the north is over and peace has been reestablished. The national elections took place in mid August and a new Malian president was chosen. All the members of our project team – in the US, UK, the Netherlands and in Mali – look forward to peace and prosperity for Mali and for Djenné in the coming years. The crisis in Egypt is reaching a violent crescendo as the country declares a month-long state of emergency. Hundreds of Morsi supporters were killed by security forces yesterday during a sit in protest. Check out the video clip below reporting on the current state in Egypt. Egyptian born Ghada Amer is currently showing her installation Hunger in Earth Matters. Amer questions the exploitation of hungry Egyptian citizens and the corruption practiced by politicians in what is referred to as “vote buying”.